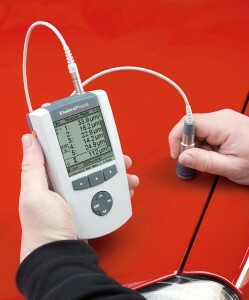 The QuintSonic 7 Coating Thickness Gauge – for coating thickness measurements of up to 5 coatings in one single operation. This precision coating thickness gauge is based on the ultrasonic impulse method and offers high resolution sensor and intelligent evaluation capacity. It will measure single and multi-layers of coatings up to a total thickness of 500 μm and with the robust gauge it is an ideal too for use in the laboratory, in production and on site. Non-destructive measurement of varnish, synthetic materials, glass, enamel and other coatings on wood, synthetic materials, glass metal and ceramics. Metal coatings on synthetic materials, ceramic and wood. Can also be used for wall thickness measurement. Suitable for measuring up to 5 coatings in a single operation. Over 40 measuring values per minute. With a mere 5mm measuring area, measurements can be done on tiny and curved parts. Graphic display showing individual coatings, zoom-enable A screen and menu-driven user guidance. For further information on the QuintSonic 7 please click here or call our sales team on +44 (0)1543 411460 to discuss your application.